We’ve commented before about the worrying outcomes that are attributable to alcohol misuse in Scotland, and now I’ve had a chance to glance at a document from NHS Scotland, Monitoring and Evaluating Scotland’s Alcohol Strategy. One thing that is immediately clear is that more young adults in Scotland appear to be drinking above recommended levels than in England and Wales. Indeed they’re more likely to be drinking above weekly recommended levels than any other age group in society. Scotland: Sick Man of Europe? The Glasgow Centre for Population Health ask whether Scotland is Still “The Sick Man of Europe”?, and broadly the answer seems to be yes. From the 1970s onward, mortality for both sexes increased significantly and by 2000 male mortality was six times the rate it had been in 1950 while female mortality was five times the rate. The steepest rise in mortality happened in a relatively short 10-11 year period from 1992, when male mortality nearly trebled and female mortality rates doubled. The report points out that recent years have seen significant improvements with male mortality dropping by 21% between 2002 and 2010, while for women mortality had reduced by 27% from a peak in 2006. So in 2010, 613 men and 286 women (aged 15-74) died from liver disease across Scotland. But the point of the report is to provide some European context to these figures and what the authors point out is that by 1998 Scottish women were proportionally more likely to die of liver disease than any other woman in Western Europe a position that Scottish men reached in 2001. Since then men have moved down the ranking slightly while women remain at the top of the rankings. 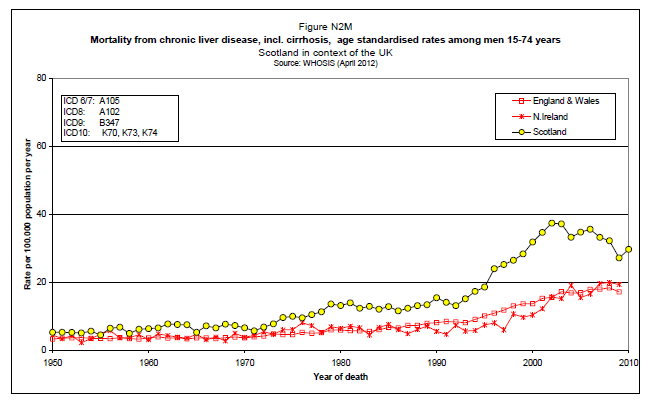 Below is a graph showing the difference between men dying from chronic liver disease in Scotland compared to England & Wales and Northern Ireland. This mental health and wellbeing toolkit produced by a range of Scottish organisations, including Barnardo’s Scotland and NHS Fife, looks like it has lots of positive ideas for responding to troubling behaviour and to help young people flourish. Parental substance misuse in Scotland is a widespread and serious problem. Reported figures of the number of children and young people affected vary, with current best estimates showing that up to 60,000 children under 16 years old have a parent with a drug problem (Hidden Harm, 2003) and up to 65,000 children under the age of 16 have a parent with an alcohol problem (Scottish Government, 2009). Today is a red letter day for the Breaking Out project, we are officially live! This week saw Shona Johnston join the Scotland team. Shona’s role is development officer for the Breaking Out project. Shona has previous experience of working with offenders within Edinburgh Prison. She worked for Phoenix Futures as an enhanced addictions case worker. Having someone with experience of working within a prison setting will be a great bonus for the project. So welcome aboard the good ship Mentor Shona. Shona and I attended an event last week hosted by the Roberson Trust (one of our funders). The RT event brought together the five main RT funded prison projects. These projects are collectively known as Breaking The Cycle. The event was attended by representatives of the BTC projects as well as a wide range of community and prison based agencies, SPS staff and managers and representatives from social work and the Scottish government. The event proved extremely useful, giving me a chance to present a synopsis of the project to the audience. I was approached by sevaral people who said they would happily support us at this, the key development stage. Shona and I have been amazed at the speedy response we have had to our requests for meetings with some key stakeholders. I suppose on reflection that we are now seen as part of the Breaking The Cycle community which lends us credibility. It was announced today that the Dynamic Youth Awards (a simpler version of the Youth Achievement Awards) will be accredited. This is great news for the project as these awards are self assessed which means your hosting body does not need to charge a moderating fee. Barnardo’s have agreed to sponsor us as an operating agency under their umberella. This means we will get all the training we need to run the awards free of charge and they will support us to develop our work to their own high standard. The DYA were originally aimed at 10-14 year olds, but after much campaigning by many agencies, the upper age limit has been removed. This is great news for young people who have literacy and communication issues (60% of young men within Polmont have some form of communication issues from dyslexia to autism and all points between). Using these awards also means we can get accreditation for much shorter periods of engagement, so getting a form of recognised accreditation will not rely on completion of the whole programme. 30 hours of DYA also counts as 2 of the 4 challenges for a Bronze level YAA, giving us a nice incentive for progression onto a higher level award. The fact that we can self assess the awards will also cut down the time between completion and accreditation. A key factor with the awards is the fact that once a young person has finished their award work, there is a formal process of assessment between you and the umbrella organisation. Then the awards are presented at moderation events which are held 4-6 times per year. So a young person could be waiting several months before they actually get a certificate. DYA will cut down this time considerably meaning we can assess award work and present at the next moderation event with no “middle man” holding up the process. A little confusing I know, but chat to me if you want more details. After next weeks holiday, Shona and I will be trained to run the awards and we can register our project. A huge step forward. We also begin to meet with the key stakeholders, making those vital connections with the prison community. Shona will receive her prison training next Friday meaning we are both free to access the prison as required. I’m currently looking for alcohol based activities that can be run with young people with communication issues. I also need examples of activities that can be used for personal development and self esteem building. If you have any ideas or experience, get in touch. The World Health Organisation have just published the findings from the Health Behaviour in School Aged Children survey, which focuses on the social determinants of health and well-being among young people, including their drug and alcohol use. The survey has comparable data from young people in England, Wales and Scotland as well as from across Europe. As you’ll see there are a number of policy reflections that the authors have which are useful collateral for us. School-based intervention programmes focusing specifically on alcohol use and targeting adolescents and their parents have considerable effects. Generic, psychosocial and developmental, school-based prevention programmes focusing on life skills and a healthy lifestyle in general are also effective and could be considered as policy and practice options. They also report that family interventions are effective in delaying the onset of drinking and reducing the frequency of drinking. Interventions in schools that focus on increasing drug knowledge, decision-making skills, self-esteem and resistance to peer pressure effectively reduce cannabis use. They also say that Motivational Interviewing has been effective in working with young people who have started to use cannabis.